"Lace-Up!" are crocheted fingerless flirt gloves that can be adjusted to fit with laces along the underside of the gloves. 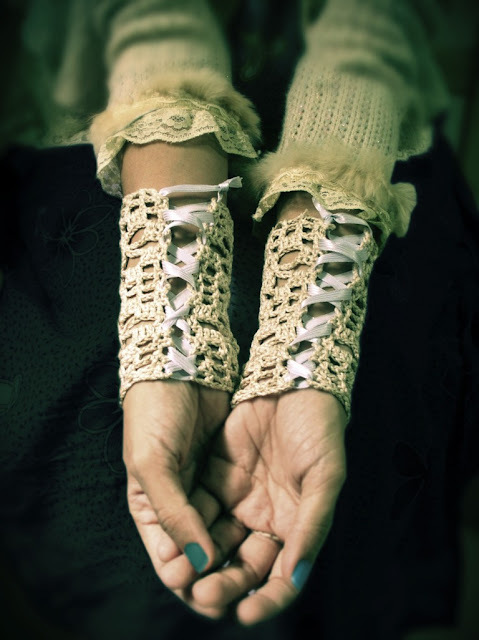 These gloves are crocheted in one piece and lace ribbons woven all along the two sides under the wrist. 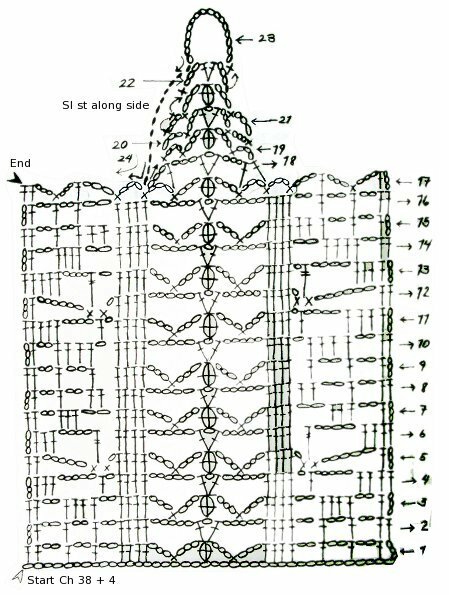 The written pattern instructions are accompanied by crochet symbol charts at the bottom of this page. 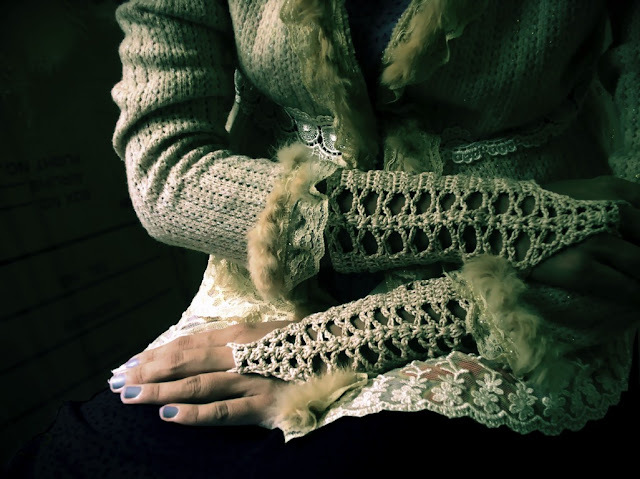 Note: The glove is crocheted in one piece and the lace is woven along the edges under the wrist. 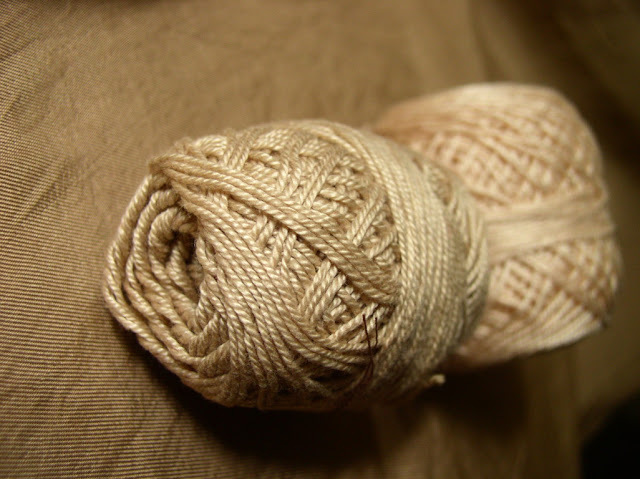 With beige and cream color crochet cotton threads held together, ch 38. Row 1: Ch 4 (counts as 1 dc), dc in 5th ch from hook, [ch 2, sk 2 ch, dc in next ch] 3 times, dc in next 3 ch, ch 3, sk 2 ch, sc in next ch, ch 3, sk 2 ch, bobble in next ch, ch 3, sk 2 ch, sc in next ch, ch 3, sk 2, ch, dc in next ch and in next 3 ch; [ch 2, sk 2 ch, dc in next ch] 3 times, dc in last ch, ch 3, turn. Row 2: Dc in next dc, [ch 2, sk 2 ch, dc in next dc] 3 times, dc in next 3 dc, ch 5, [dc, ch 1, dc] in bobble, ch 5, dc in next 4 dc, [ch 2, sk 2 ch, dc in next dc] 3 times, dc in turning ch, ch 3, turn. Row 3: Dc in next dc, ch 2, sk 2 ch, dc in next dc, 2 dc in ch-2 sp, dc in next dc, ch 2, sk 2 ch, dc in next 4 dc, ch 3, sk 2 ch, sc in next ch, ch 3, sk 2 ch, bobble in ch-1 sp, ch 3, sk 2 ch, sc in next ch, ch 3, sk 2, ch, dc in next 4 dc; ch 2, sk 2 ch, dc in next dc, 2 dc in ch-2 sp, dc in next dc, ch 2, sk 2 ch, dc in next 2 dc, ch 3, turn. Row 4: Dc in next dc, 2 dc in ch-2 sp, ch 5, dc in next ch-2 sp, ch 1, dc in next 4 dc, ch 5, [dc, ch 1, dc] in bobble, ch 5, dc in next 4 dc, ch 1, dc in ch-2 sp, ch 5, 2 dc in next ch-2 sp, dc in next 2 dc, ch 3, turn. Row 5: Dc in next dc, ch 5, sc in ch-5 sp, sc in ch-1 sp, ch 1, dc in next 4 dc; ch 3, sk 2 ch, bobble in ch-1 sp, ch 3, sk 2 ch, sc in next ch, ch 3, sk 2, ch, dc in next 4 dc; ch 1, sc in ch-1 sp, sc in ch-5 sp, ch 5, dc in last 2 dc, ch 3, turn. Row 6: Dc in next dc, 2 dc in ch-5 sp, ch 4, tr between 2 sc, dc in next 4 dc, ch 5, [dc, ch 1, dc] in bobble, ch 5, dc in next 4 dc, tr between 2 sc, ch 4, 2 dc in ch-5 sp, dc in last 2 dc, ch 3, turn. Row 7: Dc in next dc, ch 2, 3 dc in ch-4 sp, ch 2, sk tr, dc in next 4 dc; ch 3, sk 2 ch, bobble in ch-1 sp, ch 3, sk 2 ch, sc in next ch, ch 3, sk 2, ch, dc in next 4 dc; ch 2, sk tr, 3 dc in ch-4 sp, ch 2, dc in last 2 dc, ch 3, turn. Row 8: Dc in next dc, ch 2, sk 2 ch, dc in next dc, ch 2, sk 2 dc, 2 dc in ch-2 sp, dc in next 4 dc, ch 5, [dc, ch 1, dc] in bobble, ch 5, dc in next 4 dc, 2 dc in ch-2 sp, ch 2, sk 2 dc, dc in next dc, ch 2, sk 2 ch, dc in last 2 dc, ch 3, turn. Row 9: Dc in next dc, ch 2, sk 2 ch, dc in next dc, ch 2, sk 2, ch, dc in next dc, sk 1 dc, dc in next 4 dc, ch 3, sk 2 ch, bobble in ch-1 sp, ch 3, sk 2 ch, sc in next ch, ch 3, sk 2, ch, dc in next 4 dc; sk 1 dc, dc in next dc, ch 2, sk 2 ch, dc in next dc, ch 2, sk 2 ch, dc in last 2 dc, ch 3, turn. Row 10: Dc in next dc, ch 2, dc in next dc, 2 dc in ch-2 sp, dc in next dc, ch 1, dc in next 4 dc, ch 5, [dc, ch 1, dc] in bobble, ch 5, dc in next 4 dc, ch 1, dc in next dc, 2 dc in ch-2 sp, dc in next dc, ch 2, sk 2 ch, dc in last 2 dc, ch 3, turn. Row 11: Dc in next dc, 2 dc in ch-2 sp, dc in next dc, ch 4, sk 3 dc, dc in ch-1 sp, ch 1, dc in next 4 dc, ch 3, sk 2 ch, bobble in ch-1 sp, ch 3, sk 2 ch, sc in next ch, ch 3, sk 2, ch, dc in next 4 dc; ch 1, dc in ch-1 sp, ch 4, sk 3 dc, dc in next dc, 2 dc in ch-2 sp, dc in last 2 dc, ch 3, turn. Row 12: Dc in next dc, ch 6, sc in ch-4 sp, sc in ch-1 sp, ch 1, dc in next 4 dc, ch 5, [dc, ch 1, dc] in bobble, ch 5, dc in next 4 dc, ch 1, sc in ch-1 sp, sc in ch-4 sp, ch 6, dc in last 2 dc, ch 3, turn. Row 13: Dc in next dc, 3 dc in ch-6 sp, ch 4, tr between 2 sc, ch 1, dc in next 4 dc, ch 3, sk 2 ch, bobble in ch-1 sp, ch 3, sk 2 ch, sc in next ch, ch 3, sk 2, ch, dc in next 4 dc; ch 1, tr between 2 sc, ch 4, 3 dc in ch-6 sp, dc in last 2 dc, ch 3, turn. Row 14: Dc in next dc, ch 2, sk 2 dc, dc in next dc, 3 dc in ch-4 sp, ch 2, dc in next 4 dc, ch 5, [dc, ch 1, dc] in bobble, ch 5, dc in next 4 dc, ch 2, 3 dc in ch-4 sp, dc in next dc, ch 2, sk 2 dc, dc in last 2 dc, ch 3, turn. Row 15: Dc in next dc, ch 2, sk 2 ch, dc in next dc, ch 2, sk 2 dc, dc in next dc, 2 dc in ch-2 sp, dc in next 4 dc, ch 3, sk 2 ch, bobble in ch-1 sp, ch 3, sk 2 ch, sc in next ch, ch 3, sk 2, ch, dc in next 4 dc; 2 dc in ch-2 sp, dc in next dc, ch 2, sk 2 dc, dc in next dc, ch 2, sk 2 ch, dc in last 2 dc, ch 3, turn. Row 16: Dc in next dc, ch 2, sk 2 ch, dc in next dc, ch 2 sk 2 ch, dc in next dc, ch 2, sk 2 dc, dc in next 4 dc, ch 5, [dc, ch 1, dc] in bobble, ch 5, dc in next 4 dc, ch 2, sk 2 dc, dc in next dc, ch 2, sk 2 ch, dc in next dc, ch 2, sk 2 ch, dc in last 2 dc, ch 3, turn. Row 17: Dc in next dc ch 3, sc in next dc, ch 3, dc in next dc, ch 3, sc in next dc, ch 3, sk 2 dc, sc in next dc, ch 3, sc in ch-5 sp, ch 3, bobble in ch-1 sp, ch 3, sc in ch-5 sp, ch 3, sc in next dc, ch 3, turn. Row 18: Sk 3 ch, dc in sc, ch 3, [dc, ch 1, dc] in bobble, ch 3, sk 3 ch, dc in sc, sk 3 ch, dc in next sc, ch 3, turn. Row 19: Sc in ch-3 sp, ch 3, bobble in ch-2 sp, ch 3, sc in ch-3 sp, ch 3, sc in dc, ch 3, turn. Row 20: Sk ch-3 sp, sc in next ch-3 sp, ch 3, [dc, ch 1, dc] in bobble, ch 3, sc in next ch-3 sp, ch 3, sc in next ch-3 sp, ch 3, turn. Row 21: Sk ch-3 sp, sc in next ch-3 sp, ch 3, bobble in ch-1 sp, ch 3, sc in next ch-3 sp, ch 3, sc in next ch-3 sp, turn. Row 22: Sc in same ch-3 sp, sc in next ch-3 sp, ch 3, 2 dc in ch-2 sp, ch 3, sl st in next ch-3 sp, turn. Row 23: Sc in next ch-3 sp, ch 16 (finger loop made, check your size), sk 2 dc, sl st in next ch-3 sp, sl st down along side of rows 22-18 until you reach last sc of row 18. Row 24: Ch 3, sk 2 dc, sc next dc, ch 3, sk 2 ch, dc in next dc, ch 3, sk 2 ch, sc in next dc, ch 3, sk 2 ch, dc in next dc, dc in turning ch, fasten off. 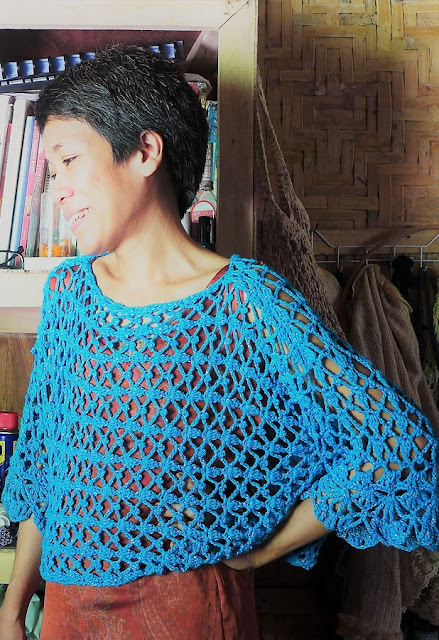 Finishing: Weave in all ends. Block the two pieces. 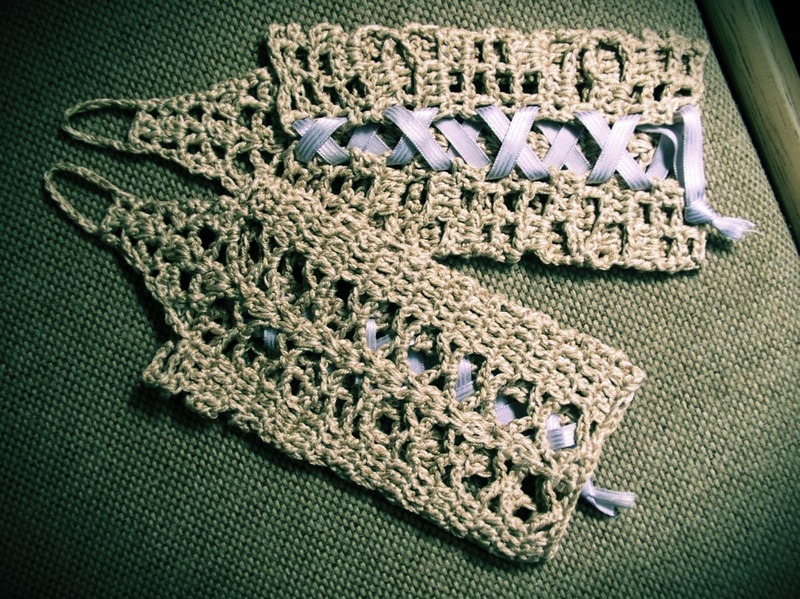 With lace ribbon, weave in crisscross fashion, starting at row 17 of the glove, down to row 1. Slip the ribbon between the two dc's along the edges of the glove. When you reach the end of the glove, knot the ends of the laces together, or leave them long and tie into a bow.